Responsive multipurpose WordPress theme suitable for almost any type of website, creative design agency, web development agency, corporate, fashion shop, startup company, app landing page, one page style and tons more. With great collection of elements to choose from and present your product it is ideal theme for your brand new website! Dikka is based on popular Twitter Bootstrap framework. This All-In-One package includes the awesome Revolution Slider Plugin (18$ Value), unlimited customizability, full WooCommerce design integration, premium Cube Portfolio plugin (16$ value), typographic options with over 600+ Google fonts, hundreds of options to make it your own, tons of useful page builder elements and pre-configured page layouts to get you started in no time! Also data content xml is included for all 4 demos. Dikka looks great on any device, from mobile to desktop and beyond. Super Clean responsive design fits to any screen. Try resize your browser window and see for yourself! With Our Page Builder, you can create columned page layouts with our 45 widgets. You will love it! Its drag and drop interface is so easy to learn and work, build pages has never so easy, all you need to do is drag, drop and create using our simple interface. All presented demos, corporate, agency, app landing and one page demo, are included on Dikka package. Install, import demos, enjoy! Dikka come with an strong admin panel (Redux Framework) where you can change the overall options of the theme, logos, colors, menus, languages, social, etc. It’s super easy to use for beginners and very customizable for advanced users. Heaps of custom transitions/animations for each object, tons of unique transition effects, an image preloader, video embedding, autoplay that stops on user interaction and lots of easy to set options to create your own effects. Customize this slider with the convenient drag and drop backend. 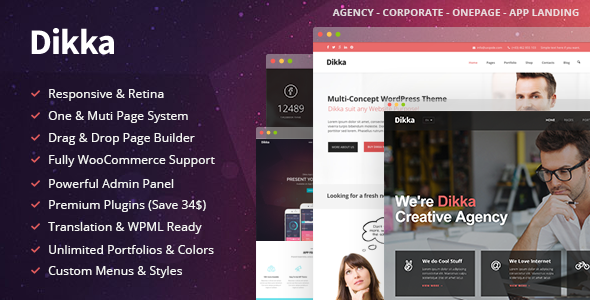 Sell your stuff with Dikka, WooCommerce 2.0+ are fully compatible with this theme. Enjoy! WPML is 100% compatible with our theme. Also dikka comes with .mo .po files, if you want to translate it to your own language. Nice and easy! Dikka comes with 6 Different menus styles that you can choose via Admin Panel, Solid Light & Dark, Transparent Light & Dark, Full Transparent Light & Dark. Also you can enable/disable features like, top bar, search functionality, woocommerce cart and others. Oh yeah Dikka have 4 styles for you! Four modern layouts to be easier for you to start creating your site. Corporate, Agency, App Landing and One Page demo are ready for you. All Pages examples are included! Dikka comes with a massive collection of icons that you can use. They are separated by styles (5) so is more easy to you find the style you want. Also the builder presents you a preview of each icon. We offer free support for all our buyers via support tickets page. Also Dikka come with a extensive documentation with HD how-to videos to help you get started with our theme. Get a hight ranking on search engines. Dikka is built with web standards and SEO best pratices in mind. It also is compatible with most of SEO plugins! Includes an XML file that enables you to import all the content with examples of slider images, portfolio items, blog posts and all the shortcodes examples. Support requests are being processed on business days from 09:00 to 15:00 (GMT +1) within 24/48h in the order they were received. NOTE: Requests received via ThemeForest comments and personal messages, email, Twitter or FaceBook will take much longer time to process. This entry was posted in Wordpress Themes and tagged agency, business, clean design, creative, depositfiles.com, download free, download rar, download theme.rar, download theme.zip, download wordpress theme, download zip, free, free wordpress theme, fullscreen, gallery, get rar, get zip, Index Of, mirrorcreator.com, modern, nowdownload.ch, nulled, nulled theme, one page, parallax, Parent Directory, photography, portfolio, rar, responsive wordpress, retina, ul.to, wordpress one page, zip, zippyshare.com by wordpress. Bookmark the permalink. Earn a lot + money with your website!